This individual used to be a professor and a Dean at Minneapolis College of Art and Design. My neighbor has known him for over forty years and introduced us not to long ago. I went to his studio to get to know his work and who he is. He is ninety years old and you would never think of it by his impeccable memory and attention to details. He is a character that grabs your attention with each syllable and animated gesture. For this portrait I was thinking of John Singer Sargent’s Madame X, except not so scandalous. The painting was fairly complex to paint with all the books in the background. I wanted the bookshelf to create a frame within a frame. Books are a passion for the sitter and hints what she enjoys to read. The patterns on her dress and pose reflect the sitter coming to terms who they are and how they confront the world. This painting has minimal information compared to the rest in the series. The symbols in the painting relate to the sitter and their identity. I wanted to show the sitters personality as it is key to their identity. This portrait is of a Chilean women in her room where she finds refuge. The figure is looking at her dog as the dog is looking straight at the viewer. The dog is a symbol for unity in her family, how it brought them together in tragic times and has been their core ever since. The rose petals in the background are symbols of death and how it has visited her family. The patterns on the blanket behind the sitter symbolize her family history. With this painting I was influenced by the Baroque masters and how they showed authority through poses. Mixing traditional techniques with contemporary colors are elements I enjoy painting with each picture. 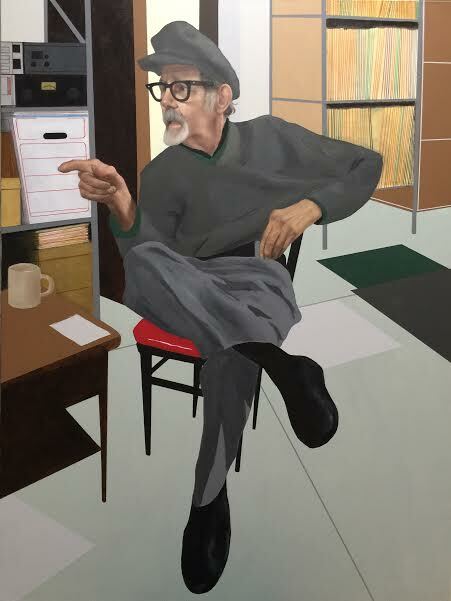 This portrait is of Danny coming to terms with himself and on his own, how he can stare to the future with confidence by having his family beside him and his belief in himself. This painting is influenced by the traditional 19th century portrait pose. 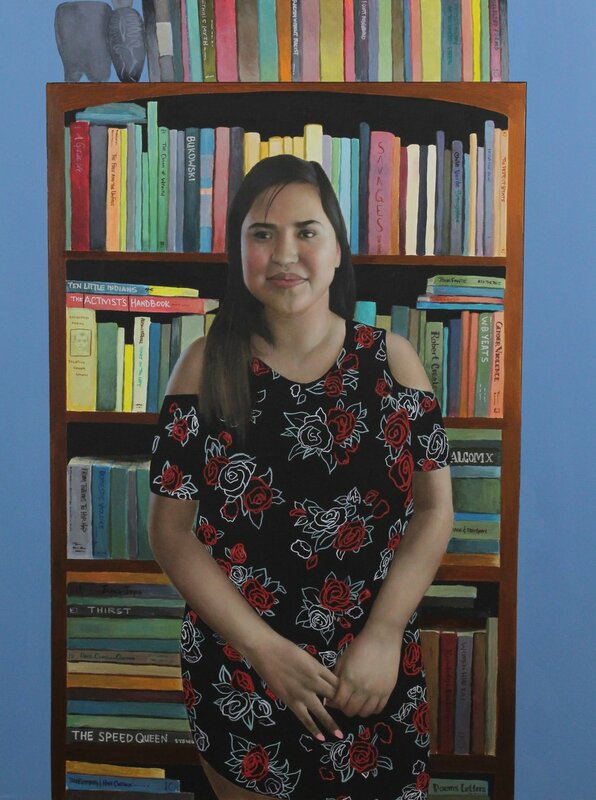 The portrait is of a friend from Columbia who has been living in the U.S. for several years. Through our conversation I learned so much of them, how they viewed their mother as a hero figure and how music is a major influence in their life. This painting is coming into terms with who they are as they are giving the viewer a slight look as if the viewer should understand this. The cork board holds a lot of clues into their identity, at first it can be mistaken for shapes, but with a closer look one can start piecing things together that were not so obvious. Mi Familia da Color a Mi Vida, is a portrait of a friend that my wife met while riding the public transportation. The nature of his pose represents his humbleness and gentle soul. The room where he is seated is the playroom for his kids. His life is his kids and is the basis for everything around them. The colors that are used in the painting reflect playfulness and tranquility. In this self portrait, I start analyzing not only myself but the objects around me and how they define my identity. The pose is typical to how I sit, always crossed and a little reclined. The shirt I am wearing is of spray cans, this signals to my childhood and how street art influenced my development with art. The sketchbook serves many meanings in the painting, a place where I find not only solitude but peace within myself. On my left hand I am holding a whisk, a symbol for my son Giovanni as this was his first toy. On my forearm there is a tattoo that symbolizes my wife. Each object in the painting is handled in different styles from my pants, shoes, curtains and portrait. The more refined areas to the simplified ones show hierarchy of story and identity. This painting shows a Latinex man sitting looking directly at the viewer. He appears to be a rapper or interested in music by the way he is dressed and the audio equipment around him. If you were to dig deeper in the painting, you start noticing how important the Catholic religion is to his identity. This was the first painting that helped me understand the new direction I was forging with my work. I was able to interview a friend of mine, and through this interview I was able to create this painting. This was a departure from my previous work, I was not restricting my palette to only using black and white. I also started experimenting with different styles on one plane. This painting shows the exact pose as Mi Familia Es Mi Mundo, except it shows the sitter at work. I wanted to show the sitter in her work environment and family setting, both worlds constructing her identity.